...the Predators decided to send us a nice box in the mail with tickets for events that may never be held. What are you doing this weekend? Hanging with us, that's what! 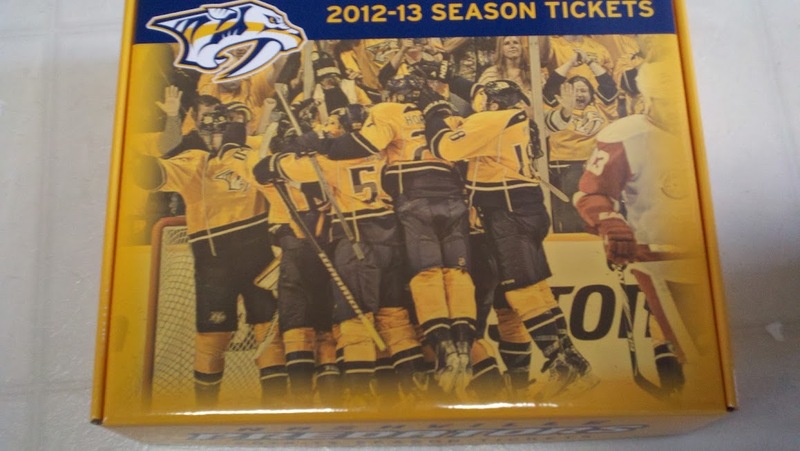 Your favorite Nashville Predators blogs are banding together in the name of a good time! Hockey Night in Nashville, Inside Smashville, Section303, Puck Scene, Smashville 24/7, Preds On the Glass and Penalty Box Radio are all inviting you to forget all about the lockout and join some of us at The Belcourt on Friday at 6:00pm. Award-winning comedian Mike Birbiglia has been touring the country for over 10 years. He's released successful albums such as Dog Years (2004), Two Drink Mike (2006) and My Secret Public Journal Live (2007) as well as a hilarious DVD entitled What I Should Have Said Was Nothing (2008). His most recent effort, Sleepwalk With Me, started as an album, became a best selling book and is now a feature film. The film version is making its way to Nashville for a limited run and we want you to experience it with us! After all, there's no pre-season anymore so you might as well get together with 100 of your closest friends and come on out for a good time! Tickets are just $8.75 for adults and $7.25 for students, children and military members. Speaking of children, if you're wondering whether you can bring your kids, the film isn't rated but Birbiglia tweeted that the rating would be PG-13. Sleepwalk has earned an 86% fresh rating on movie review site Rotten Tomatoes so you know it's going to be a good time. Plus, several of your favorite Predators bloggers are Birbigs-heads, which often results in random Birbiglia-reciting up on bloggers row during Predators games. (If that's not a testament to his humor, we don't know what is.) Birbiglia was our guest on The 303:30 back in September of 2009, just days before his last live gig in Music City. CLICK HERE to get your tickets, then join us on Friday night at the Belcourt. Since the NHL is in a lockout, we need to find new ways to amuse ourselves. September 19 is International Talk Like a Pirate Day so... "Drink up me 'earties, yo ho." With less than six hours remaining before the NHL owners are expected to lockout the players, the Nashville Predators announced that they have signed forward Craig Smith to a two year contract extension. Nashville, Tenn. (September 15, 2012) – Nashville Predators President of Hockey Operations/General Manager David Poile announced today that the club has signed forward Craig Smith to a two-year, $4 million contract that will pay him $2 million in both 2013-14 and 2014-15. Smith, 23 (9/5/89), tied for seventh among all NHL rookies in goals (14) and assists (22), and ranked eighth in points (36) in 72 games during the 2011-12 season. The point and assist totals were the second highest by a rookie in Predators franchise history. The 6-0, 196-pounder also tied for second among first-year NHLers in power-play goals (6), and participated in the rookie portion of the 2012 All-Star Weekend. A native of Madison, Wis., Smith was Nashville's sixth choice, 98th overall (fourth round), in the 2009 Entry Draft. He spent two seasons at the University of Wisconsin from 2009-11, notching 76 points (27g-49a) in 82 games and helping the Badgers advance to the 2010 NCAA National Championship Game. He has represented the United States at the past two World Championships, being named one of Team USA’s three best players at the 2011 World Championships after leading the team in goals (3) and ranking second in points (6). Less than twelve hours before NHL owners plan to lock out the players, the Nashville Predators signed defenseman Kevin Klein to a cap friendly five-year, $14.5 million contract that solidifies another piece of the Preds' blueline for the next six seasons. Friday was originally planned as the day that the Nashville Predators' rookies and younger players would report to camp to seek furtherance of their career in the National Hockey League. It turned out to be a horse of a different color with the pending lockout set for Saturday night at 11:59 p.m. CDT. Instead of heading to Smashville for a chance at "the show," twenty three players are headed elsewhere for the start of camp. The Milwaukee Admirals will be the primary beneficiary of 22 top Preds prospects while recent signee, Colton Sissons, has been loaned to his junior team in the WHL. With the probable lockout looming just hours away, the Nashville Predators signed Gabriel Bourque to a new two-year deal that will start in the 2013-14 season after his entry level deal expires this season. Nashville, Tenn. (September 14, 2012) – Nashville Predators President of Hockey Operations/General Manager David Poile announced today that the club has signed forward Gabriel Bourque to a two-year, $1.55 million contract which starts with the 2013-14 season. The deal will pay him $725,000 in 2013-14 and $825,000 in 2014-15. Bourque, 21 (9/23/90), posted 19 points (7g-12a) in 43 games during his rookie NHL season in 2011-12, ranking ninth in points per game among rookies who appeared in at least half their team’s games (.44). During the 2012 playoffs, the 5-10, 192-pound winger tied for the team lead in goals (3), and ranked third in points (5), also ranking among the rookie leaders in both categories. Bourque set franchise records for points (3g-1a-4pts) and plus-minus rating (+5) by a rookie in a playoff series in Nashville’s Western Conference Quarterfinal victory vs. Detroit, which included scoring two goals, including the game winner, in his NHL playoff debut in Game One, making him the third player in the last 14 playoff years to attain the feat. The Rimouski, Que., native – selected 132nd overall (fifth round), in the 2009 Entry Draft – helped Moncton win the 2010 President’s Trophy as QMJHL Champions and advance to the 2010 Memorial Cup, being awarded the 2010 Guy Lafleur Trophy as playoffs MVP in the process. Bourque earned a silver medal with Canada at the 2010 World Junior Championships. On Saturday night at 11:59 p.m. EDT, the National Hockey League plans to lockout the players if no new Collective Bargaining Agreement is reached before the deadline. As it currently stands, no meetings are planned and the sides are miles apart. In 2004, the last time that the CBA was up for grabs, there was a three month delay before further negotiations were attempted and eventually the entire season was lost. Hockey fans lived through the ordeal when the 2004-05 season was the first season completely lost due to labor strife in the history of North American professional sports. The NHL returned after the layoff with new rules that quickened the pace of the game and fans quickly returned to the sport that they loved. The NHL and the NHL Players Association are again banking on the fan's patience and their assumption that fans will put another lockout behind them and return in the same manner. NHL Commissioner Gary Bettman offended many fans last month when he arrogantly stated "We recovered last time because we have the world’s greatest fans." That may have worked in 2004 but will it fly once again? I was probably one of the few followers of the game that actually enjoyed the time away from the rink during the last lockout. I had two son's playing hockey and a mother living out her last few months of life. I had plenty to do and made lasting memories with my boys and mother instead of going to NHL games. When hockey returned, I did too, and was somewhat refreshed from a year where I didn't drive 100 miles fifty times in a six month period to attend games. Now as we await the lockout keys turning, instead of being up in arms that the owners and players will give fans the middle finger once again, fans should start planning how to live life to its fullest. I really like Jiff peanut butter. If it suddenly became unavailable I would not be happy. I would begrudgingly buy Skippy or Peter Pan and move on. Hockey fans should do the same. Go to minor or junior games or if you are really Jonesing for a cold building, go watch a bunch of kids play at the local house league. Football, pro or college, the baseball postseason, or many other sports are not affected by the lockout if you savor the stadium experience. Better yet, check out other things that you have never been able to do in the fall because of your dying allegiance to the sport of hockey. With all the money saved on tickets, parking and food and beverages, there are plenty of options out there. Each dollar you don't spend on "hockey related revenue" is one dollar less for the millionaires to fight over. At some point, they may miss a few of your dollars and decide to play hockey again. My suggestion is that fans tune out all the negotiations (or lack of them) and try to live life to its fullest in the extra time you are being given. Time is one of the few things that you can't make more of or increase. Value every minute and don't waste it worrying about something that is completely out of your control. Personally, I am enjoying the extra time I have been given and have not used one ounce of emotional energy being upset about the lack of hockey. I'm not the least bit concerned about the players or owners since, to an extent, they control their own destiny. The folks that we should be concerned about in this whole mess are all the folks who depend on NHL games to put food on the family table by working part-time jobs at the rink or are in businesses that depend on 41 home games to make payroll and keep the doors open. Our prayers go out to them. In summary, I'm sure everyone is hopeful for a quick resolution to the situation but instead of being upset, consider it a vacation and enjoy the extra time you have with your family and friends. In a joint announcement from the Nashville Predators and Fox Sports TN, it was revealed that 68 Predators games are scheduled to be televised over the Preds TV network this season. All will be available in HD. Additionally, NBC Sports Network will televise three games so that 40 of 41 road games will be televised as well as 31 home games. Here is the link to the complete schedule. A native of Rancho Santa Margarita, Calif., Blum became the first native of the Golden State to be selected in the first round of the NHL Entry Draft when Nashville selected him 23rd overall in the 2007 Entry Draft. Blum rounded out a decorated junior career with the Vancouver Giants (WHL) in 2009 by being named CHL Defenseman of the Year, and as the franchise’s all-time leader in defensive scoring (248gp, 49g-155a204pts). During his tenure, the team claimed four division titles, two conference titles, a WHL Championship and a Memorial Cup Championship. With the NHL lockout looming on Saturday, things have been relativly quiet on the Predators' front. Nasville did announce the signing of 2012 second round draft pick, Colton Sissons, to a three-year entry-level contract today. Nashville, Tenn. (September 13, 2012) – Nashville Predators President of Hockey Operations/General Manager David Poile announced today that the club has signed 2012 second-round draft pick Colton Sissons (KOHL-tuhn SIH-suhnz) to a three-year entry-level contract. Sissons, 18 (11/5/93), is entering his second season as captain of the Western Hockey League’s Kelowna Rockets in 2012-13. A season ago, the 6-0, 187-pound right wing ranked second on Kelowna in goals (26), and tied for third in points (41), in addition to pacing the club in power-play goals (13). Sissons also captained Team Orr to a 2-1 victory at the 2012 Home Hardware Top Prospects Game and served as an alternate captain for Team WHL at the 2011 Subway Super Series. The North Vancouver, B.C., was Nashville's second choice, 50th overall (second round), in 2012 Entry Draft, and says he models his game after Predators forward Mike Fisher. 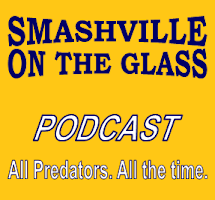 After a summer hiatus, Ryan Porth and I returned with a new "Lockout Looming" edition of Smashville on the Glass Radio. No one has been closer to the negotiations than Chris who is the primary hockey writer for the Canadian Press and NHL Network panelist. Chris gives his insight and has a surprisingly optimistic outlook that hockey will return sooner than many have speculated. Ryan also has an interview with Colin Wilson and there is plenty of Preds discussion to round out the show. Take a listen in the following player or go to iTunes to download.